Campaign for the American Reader: Pg. 69: Ryan Kirk's "Nightblade's Vengeance"
Pg. 69: Ryan Kirk's "Nightblade's Vengeance"
Featured at the Page 69 Test: Nightblade's Vengeance (Blades of the Fallen) by Ryan Kirk. In a thrilling fantasy series from the author of the Nightblade novels, revenge becomes a quest for a young female warrior. In a feudal land, a Kingdom is at risk. 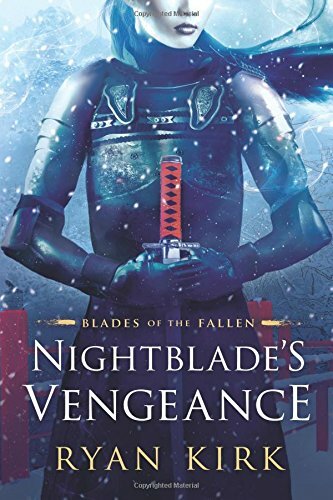 With no heir to the fragile throne, its future rests with the powerful members of the dying king’s Council, including Minori, a nightblade warrior, and Kiyoshi, a dayblade healer. The two men are bound by the sword but divided by two opposing principles: rule the land, or serve it. In their challenge for supremacy, a spark has been lit. Her name is Asa. Her creed is revenge. A fierce nightblade warrior, she’s spent a decade in pursuit of the enigmatic general who killed her father in a violent revolt—then mysteriously vanished from all records. Now, her desire for reckoning has led her to the village of Two Falls—and straight into the heart of an impending civil war. Minori and Kiyoshi are vying for her loyalty. And Asa must choose sides. As fresh betrayals unfold and a new uprising looms, Asa knows that chasing a ghost is no longer just a personal quest for retribution. It’s going to alter the fate of the entire Kingdom. The Page 69 Test: Nightblade's Vengeance. Pg. 99: Elizabeth Rosner's "Survivor Café"
What is S.F. Henson reading? Pg. 69: Craig Schaefer's "Cold Spectrum"
What is Karen Ranney reading? Pg. 69: S.F. Henson's "Devils Within"
Pg. 99: Laura Engelstein's "Russia in Flames"
What is Margaret Duffy reading? Pg, 69: Amy S. Foster's "The Rift Frequency"
Pg. 69: Karen Ranney's "The Texan Duke"
Pg. 99: Paul Halpern's "The Quantum Labyrinth"
Pg. 69: Margaret Duffy's "Murders.com"
Pg. 99: Aidan Forth's "Barbed-Wire Imperialism"
What is Linda Gordon reading? Pg. 69: D. Nolan Clark's "Forbidden Suns"
What is Paul Halpern reading? Pg. 99: Gregory A. Daddis's "Withdrawal"
Pg. 69: S. Shankar's "Ghost in the Tamarind"
What is Abeer Y. Hoque reading? Pg. 69: Nikki Katz's "The Midnight Dance"
Pg. 99: Abeer Y. Hoque's "Olive Witch"
What is Tracey Neithercott reading? Pg. 69: Bradford Morrow's "The Prague Sonata"
What is Sarah Porter reading? Pg. 69: Tracey Neithercott's "Gray Wolf Island"
Pg. 99: David Howard's "Chasing Phil"
What is Sarah Bailey reading? Pg. 99: John Marmysz's "Cinematic Nihilism"
Pg. 69: Ellie Alexander's "Death on Tap"
What is David Biespiel reading? Pg. 69: Sarah Shoemaker's "Mr. Rochester"
What is Wiley Cash reading? Pg. 99: Meryl Gordon's "Bunny Mellon"
Pg. 69: Sarah Bailey's "The Dark Lake"
Pg. 99: Johann N. Neem's "Democracy's Schools"
What is Meryl Gordon reading? Pg. 99: Peter Zheutlin's "Rescued"